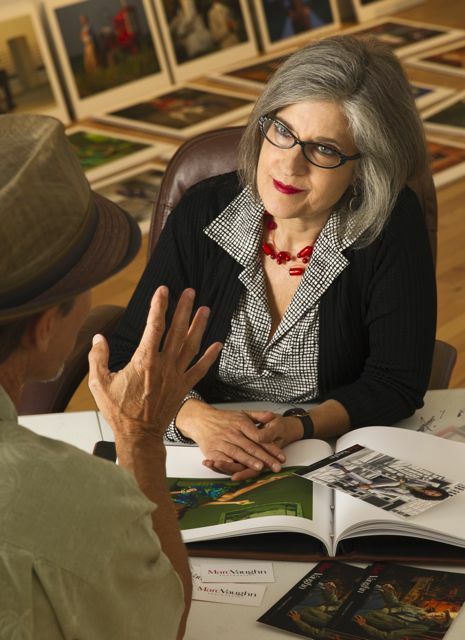 How to “impress the judges” at a face-to-face photography portfolio review. Ever feel like your in-person portfolio presentation is a bit like being a contestant on American Idol? Whether you’re “performing” at a one-on-one portfolio presentation or at a portfolio review event (where you’ve signed up for a series of 20-min. with multiple reviewers), to cement that contact and land that dream assignment, here are some ways to improve your odds of getting serious attention and even score that gig. Prepare. Google is your best friend. Doing your research provides clues about what content the reviewer might need from you. If you’re seeing multiple people in a day, have more than one presentation (or an easy-to-edit one) so you can tailor each presentation with the most relevant work up front. The portfolio should open with your strongest and most relevant image. Close with the second strongest. Remember, some people start from the back when they flip through a printed portfolio. The middle should flow well and reinforce your main vision. Connect .Try to see someone beyond their role as the keeper-of-the- assignment-purchase-order. Be interested in them. Make eye contact. Give a good hand shake. Relax. Breathe. If you’re a bit nervous, be honest. It’s ok to be real. Most relate more to honesty than bravado. Let them drive. How fast they flip through the book is NOT an indicator of interest or disinterest in the work. Remember, the reviewer has probably seen thousands of portfolios. Thousands. Absorb deeply. If a reviewer makes a suggestion, consider it seriously. If more than one reviewer says the same thing, DO IT!!! If you’re getting the vibe they like your work, then ask them about their follow-up preferences as to frequency and format. Some like printed pieces. Some like to save trees and prefer only emails. Some have no preference. Before you leave the event, record their preference in your contacts database and then do what they say. Reviewers like talented photographers who do their homework, are relevant, connect, and have a sense of the buyer’s needs. If it’s really going well, ask if they’ve a colleague who might also be interested. If they say yes, ask if you can use their name as a reference. Reviewers usually like referring photographers who have all those qualities. They won’t, if you don’t. Bottom line: The time you spend together, once it’s over, is gone forever and neither of you can ever get those minutes back. Spend your minutes wisely and remember to thank them for their time investment. http://cpottsdev.com/wp-content/uploads/2015/09/web-header.jpg 0 0 carolyn http://cpottsdev.com/wp-content/uploads/2015/09/web-header.jpg carolyn2014-02-17 16:51:082016-06-10 15:59:46How to "impress the judges" at a face-to-face photography portfolio review.